I am sooooooooooooo happy to report that both my dogs are doing really well on the food...... more settled.......... happier......... calmer. AND my poor sick little dog with pancreatitis has had a complete recovery with using the Happy Tails kibble combined with some canned gastro food. Ratio is about 2/3 Happy Tails to 1/3 gastro. Thank-you so much for this product........... my dogs are doing much better than they were on the raw diet. 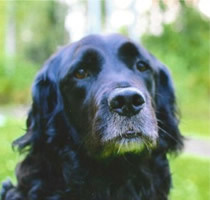 Stash is an 8 year old Golden Retriever / Black Lab / Cocker Spaniel. A friend of mine told me about the Happy Tails dog food a few years ago and I started feeding it to her. Stash keeps in good shape by going on runs with me and by eating this dog food. She has a shiny, healthy coat. After my 4 year old grey tabby Dexter was diagnosed with kidney disease (he was hospitalized twice in one year on IV and multiple medications), I was told that he had roughly one year to live. He was put on a low protein diet food from the vet due to his low kidney function. He did not care for the food at all and I tried many different kinds. He was losing weight fast and I was worried. My mom cat-sat for me while I went traveling for a month unbeknownst to me she changed his food to Happy Tails, what her two cats were eating. When I came home he had gained weight, had a silkier coat and just appeared to have more energy in general. I have been feeding Dexter Happy Tails ever since and refuse to try another food. That was 6 years ago and I still have my beautiful energetic cat that has not seen a vet since! I am so thankful for this amazing food!!! I recently adopted a rescue dog and am transitioning him over to Happy Tails as well!!! Thank you so much for creating food that I constantly recommend to pet owners. Here is a picture of Bella with Jay and myself. Bella is an explosive expert who has saved many lives and works exclusively with OMLT HQ. Bella loves the food that you sent and Jay was very impressed with the quality and nutritional value... he can see the difference in Bella, and both send their many thanx. We started using Happy Tails dog food as soon as our local health food store started carrying it. We had been concerned about the quality of dog food especially after the Melamine scare and so we were looking for a good quality dry dog food that was made in Canada. One of the things we noticed right away after our dog started eating Happy Tails was the decrease in the number (and smell) of stools she had in a day. This told us that this brand was not made up of useless filler. We also found that we needed to give our dog much less food to meet her nutritional needs, again confirming this is a quality dog food. We now have a new dog. We didn't want to switch her over to Happy Tails all at once in case it didn't agree with her so we decided to mix Happy Tails with the food she had been previously fed. Well our dog had no qualms about switching over, in fact, she would pick out the Happy Tails out and eat that first! A definite endorsement from our dog for Happy Tails. Had to write and thank you for the great food you have developed. Our fur babies have been enjoying it for almost a year. We had them on Blue, but the price was costly and my cats didn't do so well. Then we heard of Happy Tails and the fact that it's made right here in BC and that you only make one type (the right type) for both dog and cat. My 3 cats love it!! I love it as it's good quality and my cats don't need to empty the bowl to be satisfied - that also goes for our Husky/wolf who also loves his food. You have 4 fur babies and 3 humans that give you all: high fives (high four), fist bumps (paw bumps) and pats on the back! Thank you for caring about the four legged family members! We will continue to feed our "pets" the Happy Paws, as we like Happy Pets! We are a couple from Spain who have been travelling in your incredible country this summer (Jasper, Banff, Calgary, ...). Knowing that Canadian feed are the best, we bought one bag of your brand in a super market (we looked at the composition and saw it was very good). We took it to Spain for our cat Dinky and he loves it! He is happier and has more energy than before. We've visited your web to learn more about your cat feed and we've seen that you only sell it in Canada, what a shame! Is there any possibility to buy it by internet and to receive it here in Spain? 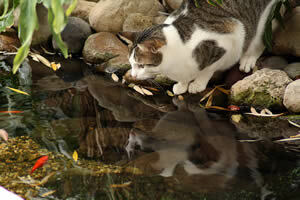 Attached, you will find a picture of our cat, Dinky making mischief. I have been using Happy Tails for a long time now, first with our English Mastiff who was a very picky eater loved your food and thrived on it from a puppy, unfortunately we lost him to leg issues unrelated to food. 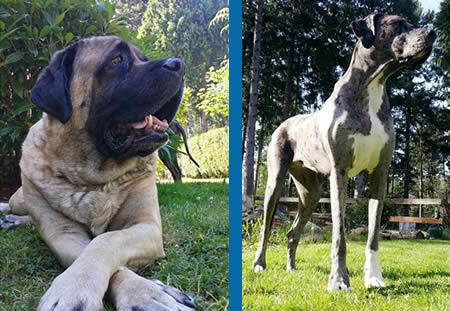 These pictures are of our adopted English Mastiff Rufus and Zoe our adopted Great Dane. Zoe came with major skin issues being fed a food from the Veterinarian; her condition cleared up after several weeks once she was switched over to Happy Tails with no skin issues since! She is always being admired for her lovely coat! 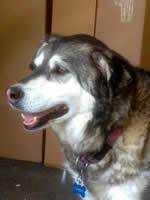 Both dogs love the food and are thriving on it after 2 ½ years with us now. I often recommend your food to people and also it is made locally! My dog, Maxi, has eaten "Happy Tails" all her life - 4 years. She is happy, healthy and an enthusiastic eater! Almost everyone who meets her remarks on her very shiny, healthy-looking coat. 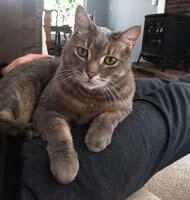 Maxi has a friendly, good-natured temperament, and lots of energy for play. Since we live in the country, her main job is keeping bears out of our yard - a task at which she excels. 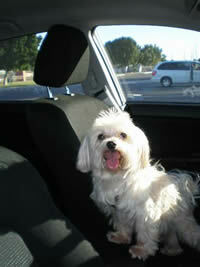 I want to feed Maxi the best quality dog food that I can find – that’s “Happy Tails”. Chevy's coat is shiny, her eyes are bright and she loves her happy paws!! My dear old Chevy is 16 years old & thrives on your tasty crunchies! Chevy & I both thank you for making such a healthy food & made right here in Canada! Best Wishes! 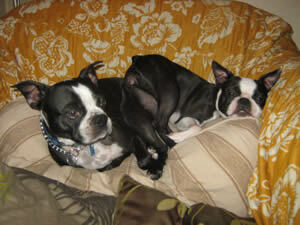 My female Boston terrier Deedee came to me as a puppy with terrible Colitis, she had rectal bleeding, her fur was falling out and her growth was extremely stunted. I switched to Happy Tails after trying many things and she instantly grew to size, stopped bleeding and her and my other Boston Sam often get compliments on how extremely shiny their coats are. I'm so glad you saved Deedee, and also that you are an affordable dog food. We suffered some job loss and medical problems in my family, but because Happy Tails is so reasonably priced, my dogs can continue to eat quality food. Sonny our 2 year old yellow lab has been plagued with seizures every two months. The probable cause is intestinal troubles. He is a wonderful happy go lucky dog and my husband and I found this very upsetting. Three months ago we started Sonny completely on Happy Tails after weaning him off the veterinary food. I feel fortunate at this moment to say Sonny has not had a seizure in over 3 months now. His tummy has settled down and we rarely have any stomach issues with him. 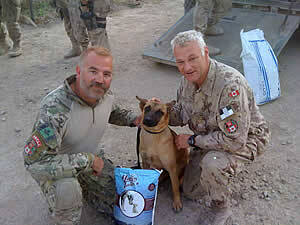 Happy paws is a great product and we have since recommended it for our sons new rescue dog. Thanks for this great food. 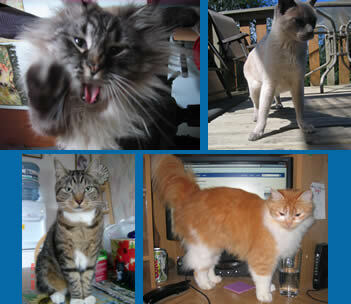 We have four cats; Zeus 8 years, Seymore 5 years, Thai 12 years, and Charlie 2 years. All of whom have their own very unique eating habits. I work in a well known health supplement store and therefore am able to recognise the unpleasant ingredients too often listed in readily available name brand cat foods. One thing that had always bothered me about our cats food was the amount of fillers and chemical names that appeared in the ingredients list... chicken by-product meal, wheat gluten, guar gum! So when I was able to bring home some of the Happy Tails I was excited to see the result. Not only did ALL FOUR of my cats devour the little bit I gave them at first to try, but they were weaving between my legs, begging me to fill up their dishes again. Our Himalayan, Seymore was by-far the most enthusiastic. Sometimes he still gets a couple pieces as a treat throughout the day. It is not just the great taste either. Our eldest Thai has arthritis, and was not doing much but going up and down the stairs once a day for bed, but now he is able to join the other cats outside and lounge in the sun. I will continue to give my cats this great tasting, good-for-them diet and hope to have an even greater amount of time with them to make long lasting memories. 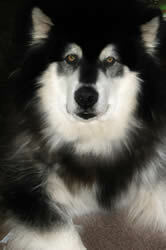 Last summer we noticed our purebred Alaskan Malamute, Kodi, drinking abnormal amounts of water and panting heavier than usual. At first we thought it was the hot summer weather but then we realised he had gone blind. Turns out he has Cushing's Disease. Digestive disturbances is one of the problems associated with this disease of which Kodi started suffering from(bloating, gas, diarrhea). We tried switching to other dog foods & making our own homemade foods. These seemed to work temporarily but he would again start suffering digestive problems for no apparent reason. We tried Happy Tails because I had heard good things about it when working at one of the stores that carries it (49th Parallel, Ladysmith) and the content appeared to be healthy. Almost immediately we noticed improvement, as long as we feed him only the Happy Tails his stool is firm, no more diarrhea, little bloating and gas. While this disease will eventually get the best of our dear Kodi he is healthier and feeling better since we switched to your food! Sammy is our 13 year old Maltese terrier. He started life with another owner who after a few months decided having a dog wasn’t for her and he eventually came to us at 6 months of age. Sammy over the years has suffered from continuous skin infections and has been on numerous medications including steroids to no avail. At one point he was scratching almost all the time and we considered putting him down because his quality of life was next to nil. As a last resort we tried the raw food diet and his condition improved. This diet is very expensive and a friend talked to me about Happy Tails. Sammy has been on it for several weeks. His skin is healthy and he is off all medications. Thank you so much for developing such a wonderful product. 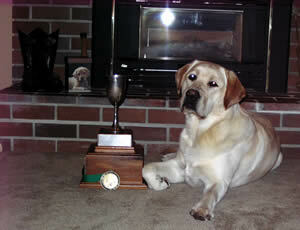 Sammy is thriving and with your help we hope to have a few more years with our beloved pet.